Do you want to get rid of the piles of junk and useless objects in your garage, loft or basement in Beckenham? Then call 020 8610 9182 and tell us your expectations about the perfect clutter-free house of your dreams. We are a group of experts who specialise in delivering exactly what you are looking for – professional house clearance Beckenham solutions. 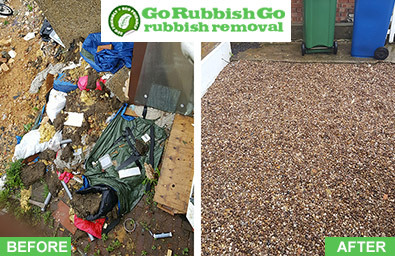 We at Go Rubbish Go are famous for the meticulous crews that work for us, as well as for offering the best house clearance in BR3 area. Trust us to make your house clutter-free again and you will easily find out why we are the best. The low prices are only one small part of that we can offer you. One knows that high quality has its price, but that’s not exactly the case with our Beckenham house clearance services. They come with great quality at very low prices so they could fit easily in anyone’s budget. We guarantee that you will find that our services in BR3 come at the lowest prices in town. Our phone number is 020 8610 9182 and just a call is enough to make your booking. Ask our company coordinator how to save money with us too, because our numerous seasonal discounts could lower the total cost for house clearance in Beckenham, BR3 even more. What really makes us the best for your local BR3 house clearance is our professionalism. We will get the job done in no time, which usually is by the end of the very same day you call us. This is possible thanks to our various services, which are customised to suit all your needs. If you want us to deal only with de-cluttering the garage, we will do it. If you need an assessment of the rubbish done, we will take care of it too. Our men are professionals who always arrive on time, which is a guarantee for getting the job done quickly and efficiently, while the great attention to detail is just another proof that our Beckenham house clearance crew is the best. You can always book by phone on 020 8610 9182, or by visiting our site. Our great customer service provides an immediate response and info, as well as may ask you about your expectations, requirements and more specs about that we have to deal with as part of your house clearance in Beckenham. If you don’t know these details then we will deal with what we have to deal with. The professional BR3 house clearance equipment that we use such as ladders, protective gloves, handling gear, heavy-duty bags, boxes and other special tools, let us to do the job in the quickest yet most efficient manner. We always know where to start and what to do next. Talk to an expert on 020 8610 9182 to learn more about all our main and additional BR3 house clearance services. For example, shed and attic decluttering, as well as clearing out garages and basements in Beckenham are our specialty. We can offer you a number of other services too, such as sorting and de-cluttering, assessment, re-selling or recycling options, and more. 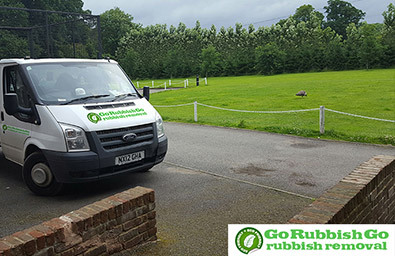 Collection of rubbish and its disposal or recycling is much easier with our specialized pick-up vehicles. They let us offer metal scrap collection services or even scrap vehicle collection as part of our Beckenham house clearance services. Consulting our clients is one of the first and most important tasks we take on, because we assess every specific case according to our client’s requirements. We can consult you by phone, while choosing the best method for Beckenham house clearance is possible thanks to our crew’s numerous years of experience. Call us, tell us your expectations, and don’t postpone booking. Continuing to hoard useless objects is by far not the greatest idea, because a clutter-free house gives you unparalleled advantages. If you have other specific questions just call us! 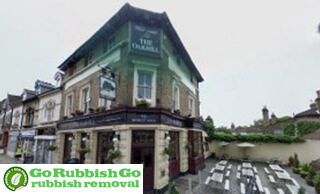 You will find that house clearance BR3 is much easier and more effortless with Go Rubbish Go on board. It usually takes only a couple of hours for our crew to arrive, and there are so many interesting things to do in Beckenham in that time. The small urban area of Beckenham, located in the London Borough of Bromley, has many green corners the quiet atmosphere of which is perfect for relaxing walks. Beckenham Green and the adjacent St. George’s Church are a good example. Christ Church is a famous historical sight here, while the nearby High Street has many modern shops, eateries, bars, pubs and shops places you can visit. The good transportation links of the area allow you to visit all your favourite places in the capital easily too.